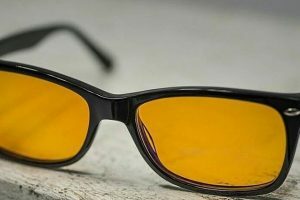 This is a product review for the Spektrum Prospek Elite Computer Glasses. I received these glasses for free directly from Spektrum. The only thing they asked for in exchange was an honest review. Not only does this review feature in-depth research but I personally wore these computer glasses for hours and also asked a coworker to try them and give me feedback. 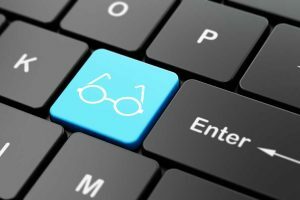 Spektrum is a company founded by two computer guys who realized that long hours on their computers might be damaging their eyesight. They began manufacturing and selling blue light blocking computer glasses. 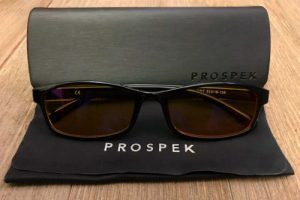 Spektrum’s line of blue light blocking glasses is called PROSPEK. 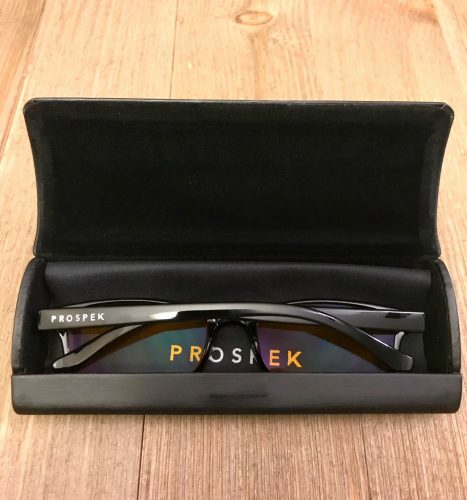 All PROSPEK lenses are made out of polycarbonate in order to have the most durable lenses possible while helping to keep price down. Each of their blue light blocking glasses come in basically two types, 50% blocking and 99% blocking. 50% blocking glasses block 50% of blue light and are ideal for mid day use. It also allows more light through which means that your color distinction will be better. 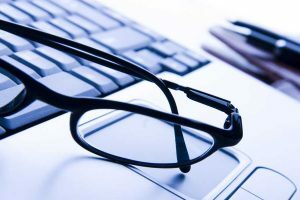 Therefore they tend to look like regular prescription glasses instead of computer or gaming glasses. 99% blocking glasses block 99% of blue light and are best suited for late night use. This is when blue light has the more harmful effect on your eyes. It’s more harmful because there’s less light available, therefore what you do take in is more blue light than anything else. 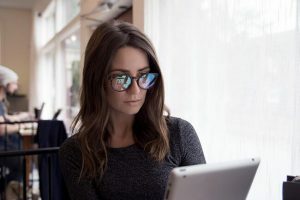 99% blocking glasses is ideal for those who are most sensitive to blue light or those who spend time on computers in the evening or in the dark. However, these glasses will have colored lenses, which can be distracting at first, but honestly, after a bit you just get used to it. What’s blue light and why does it matter? Blue light is light that’s emitted by electronic devices. In the United States, we spend, on average, over 7 hours a day in front of a computer screen. That’s not counting the time we spend on our smart phones. Personally, I work in front of a computer all day and then I come home to a computer, television, and an iPhone. 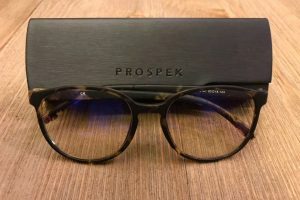 I end up spending most of my time looking at screens, which is why I feel so strongly about the health benefits that glasses like Spektrum can bring. An excess in blue light can cause what’s referred to as Computer Vision Syndrome (CVS). Some of the symptoms are burred vision, headaches, light sensitivity, dry eyes, and insomnia. The Prospek Elite line lives up to its name by employing a stylish and sleek design. UV rays or better known as Ultraviolet rays are actually more harmful than blue light is. It can worsen a disease called Macular Degeneration in some people and/or contribute to Cataracts in others. Using these glasses, you’ll notice an increase in eye health within days. Your eyes will feel less pressured and less strained, you’ll be less likely to get headaches and you’ll probably even sleep better. 90 days return policy, no questions asked! 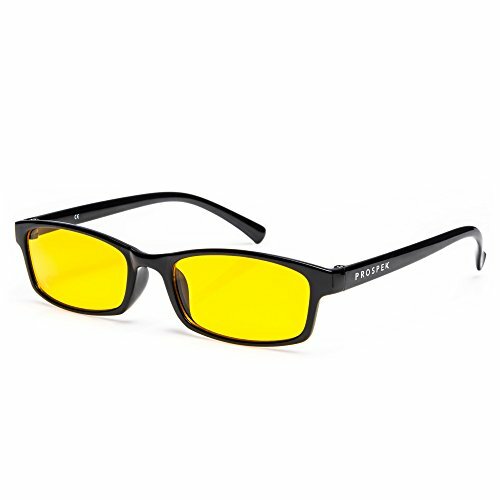 Where can I buy Spektrum Prospek Elite Computer Glasses? Check the price on Amazon.com here. Check the price on SpektrumGlasses.com here. Right now they’re similar in price on both sites. What makes this a no brainer is the 90 day Money Back Guarantee. 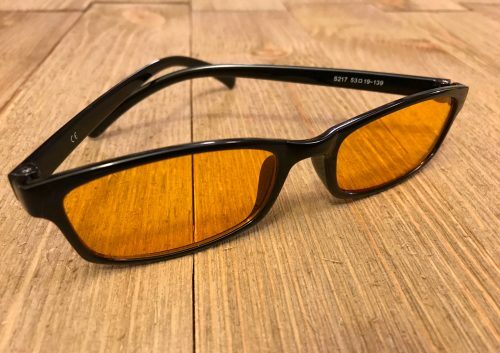 These glasses are especially powerful because they block 99% of oncoming blue light. 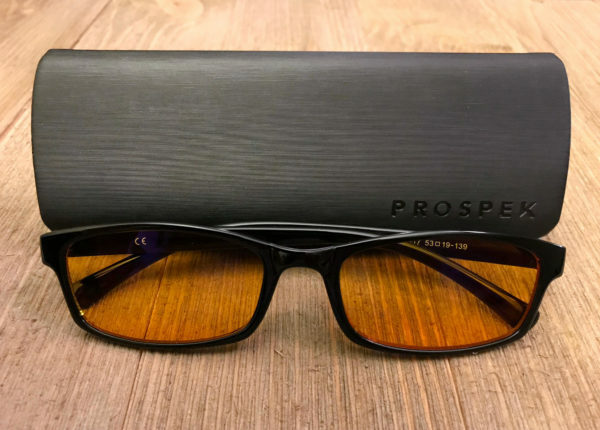 These Spektrum Prospek Elite Computer glasses will relieve your eyes and help prevent headaches and eye strain associated with long hours in front of the computer or television. Not only do they look good, they block 99% of blue light. When I first opened them, I was pleasantly surprised at the quality of the eyeglass case. It’s a hard case with a velvet interior. I learned that Spektrum sells the case separately on Amazon. Honestly, I would be tempted to buy the case to use for any pair of glasses! It also comes with a cleaning cloth. Be warned, these glasses feature an extremely strong yellow tint that will take some getting used to. It’s very noticeable not only for the wearer but for everyone else around them. Although it does block 99% of blue light, I just could not get used to the yellow tint. I’m used to computer glasses so I didn’t think the tint would bother me, but it was just too strong. A coworker of mine has the same model glasses, but the 50% blocking ones. So I asked him to wear them for the day and give me feedback, below is what he said. If you own or have used these Spektrum Prospek Elite Computer glasses, I would love to hear about your experiences below.